Unmanned systems are all the rage at this week’s AUVSI Xponential in Dallas. From our first impressions, the markets for drones and related technologies are healthy, based on business and technology developments. DALLAS — At AUVSI Xponential here yesterday, thousands of attendees gathered to learn about the latest in autonomous systems. Conference sessions, networking events, and arriving exhibitors focused on different aspects of the fast-growing market for unmanned systems on land, in the air, and on and under the water. While autonomous unmanned vehicles have very different capabilities by vertical sector, attendees were all bullish on the industry’s prospects. The aerial systems market alone will have a compound annual growth rate of 13% to reach $19.85 billion by 2021, predicts Technavio. In this reporter’s notebook, let’s take a quick look at some first impressions from this week’s drone show. Like industrial automation, the principles of unmanned autonomous vehicles have been known for years. 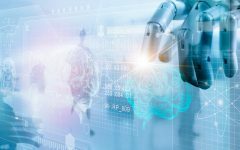 As with robotics, relatively recent improvements in hardware such as more capable cameras and motors and the development of machine learning and big data in the cloud have opened up new applications. Most of the end-user cases presented at this year’s Xponential, from infrastructure inspection in the energy industry to gathering detailed information for weather forecasts, are already here. Gone are theoretical or academic presentations; many attendees I spoke with were actively comparing notes and looking for technologies to help their businesses. After the Federal Aviation Administration released its rules for non-recreational use of unmanned aircraft systems last year, the competition for waivers and uncertainty about U.S. airspace faded (but isn’t completely gone). This paved the way for potential drone deliveries, as well as the use of unmanned systems for agriculture and entertainment, such as Intel’s Shooting Star systems, which performed at this year’s Super Bowl and Coachella. Similarly, the European Aviation Safety Agency has proposed regulations for the operation of small drones, and standards organizations are looking to develop rules to pre-empt a patchwork of local laws and facilitate interoperability. Of course, for testing of autonomous systems — similar to self-driving cars — companies look to jurisdictions with relatively few rules, the open space to test them safely, and support from universities and research laboratories. Robotics Business Review spoke with people from Intel, Lockheed Martin, and Boeing, as well as with startups from Boston, New Mexico, and more. Engineers and executives noted that everyone is hungry for innovations in sensors, artificial intelligence, and business models. With drone usage comes the need for security precautions, represented by panels on countermeasures. The defense industry is well-represented at Xponential, but so too are precision agriculture, oil and gas, and logistics. Reservations about weaponized drones are giving way to a realization that, as with other innovations — ARPANET, anyone? — high-resolution imagery, precise machine-assisted controls, and data sharing are limited only by users’ imaginations. In fact, unmanned systems will soon be working in warehouses, inspecting towers, or gathering land-use or crowd data near you, if they aren’t already, so it pays to learn about local and global players. Along with self-driving cars and AI, autonomous systems companies have been the subject of strong interest, as we’ve recorded in recent quarterly transactions reports. Don’t expect the rate of industry startup funding and consolidation to slow down anytime soon. Some vendors are working hard to commoditize hardware so that university graduates and startups don’t have to reinvent the wheel for each new unmanned system. Standardized gear should free up developer talent for devising new applications. More importantly, the use of machine learning techniques to train systems to perceive and react to their environments. While traditional AI might have transparency, “deep neural networks have the ability to adapt and learn on the fly,” said Jeremy Wurbs, a senior researcher at Boston-based Neurala Inc. Deep learning take more data and time to train, but it has proven to be the best for object recognition, optical character recognition, understanding traffic signs, and medical imaging recognition, he said. AI (in the broad sense) could then allow operators to focus on higher-level functions, such as drawing conclusions from the data gathered by multiple mobile sensors. Drones in Warehouses – When Will They Take Off? As regulations clarify the parameters for UAVs and similar systems, training and certification have become key to ensuring that there are enough qualified operators to grow the industry, said Ulrich Hoffman, project lead of UAV services at Lufthansa Technik, which offers free online training to pilots in Europe. RBR met with attendees from Europe, Latin America, and East Asia who all said that their organizations need to address workforce concerns, regulatory issues, and how to distinguish themselves in a dynamic, crowded market. At the same time, they and upcoming panels demonstrate confidence that commercial use of unmanned systems across industries will continue to grow.